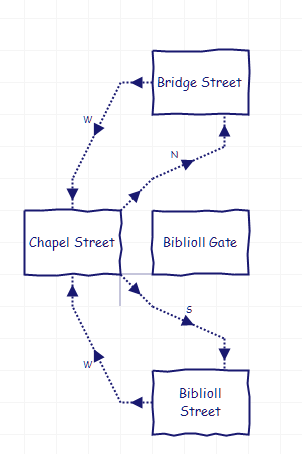 This will probably be as newbie as a newbie question can be, but I just started playing Christminster and I don’t quite understand the directional system from the getgo. 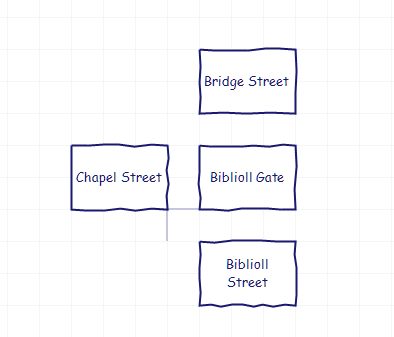 We start on Chapel Street, and we can’t go east because that’s where the locked Biblioll Gate is. So we can either go north to Bridge Street or south to Biblioll Street. Except if we go north to Bridge, the only way to get back to Chapel is by going west. And similarly, if we go south to Biblioll Street, the only way to return to Chapel is by going west. So in short, from Chapel Street, it should’ve been a NE to Bridge and a SE to Biblioll. Or am I incorrect? It’s considered a bit of an anti-pattern now, but non symmetric room connections are quite common, especially in older games. I’m not sure how you’d do it in Trizbort, but I’ve usually seen them mapped as lines with a 90° bend so that it goes north from Chapel St and west from Bridge St. Thanks – I guess this is the best way to map this. I’ve played Zork and the like a long while ago and remember seeing this type of a layout, but I’d thought that after another 15 years or so had passed, authors would’ve done away with this. Ah well. 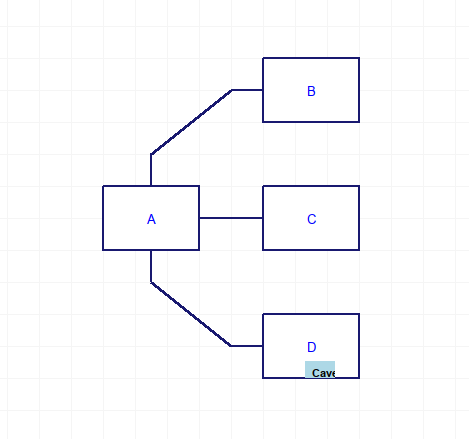 It just makes it a bit of a nightmare to map, and makes Trizbort’s automapping pretty much useless. I’d thought that after another 15 years or so had passed, authors would’ve done away with this. Christminster was written in 1995, so it was really still in sight of the classic text games of the 80s and was taking a few pages from them. You’d be hard-pressed to find a new game that fell back on these types of directions, but I could very well be wrong. Still, it’s good to be familiar with how things were done to appreciate why things are done the way they’re done today. To map this cleanly, you don’t need two different lines between the blocks. For the Chapel Street to Bridge Street connection, for example, the one line you have labeled “w” will do it if you remove the letter and the arrows. Since it connects to the North side of the Chapel Street box and the West side of the Bridge street box, that one line is really all that is needed to diagram this relationship. Just think of it as a road that curves on the way. ^ what Mage of Maple said. Here’s how I’d draw it. i really don’t think it’s a spoiler to mention that you start with a map in your handbag. It makes the street layout much clearer.